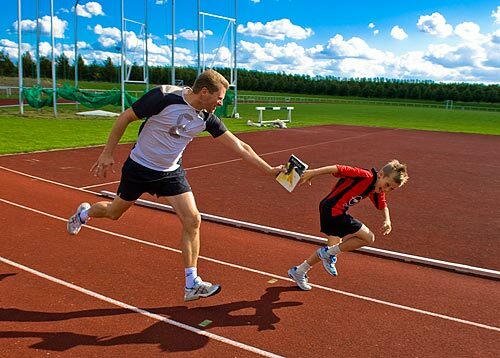 The picture above illustrates the theme “Pass It On!”. Click on it to see a larger version. 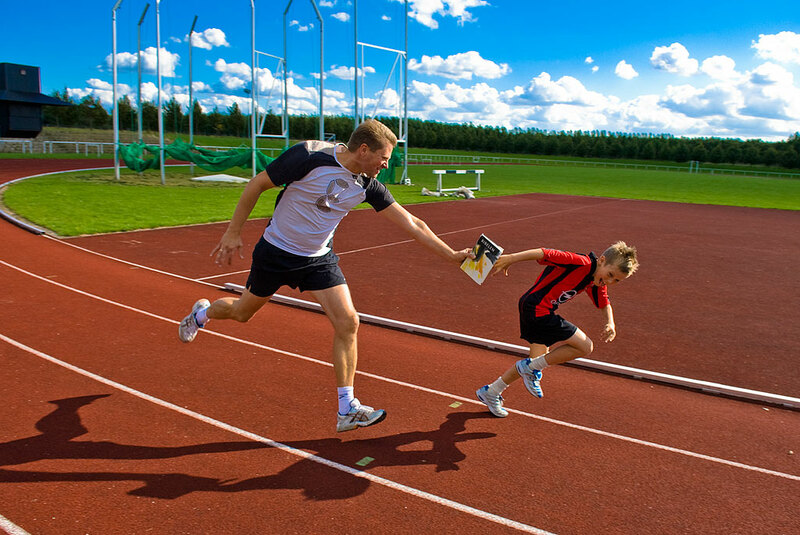 I had this idea of a relay race, with a dad passing on the baton to his son — only in this case, the baton would actually be a Bible. First problem to overcome was to find a course with clear track marks, to show clearly what is going on even with a tight crop. Most of those around this area are pretty much worn down, but the “model” above (my younger brother) figured Google Earth could locate one for us. Indeed it did, and off we went! Next problem was that the track was actually only accessible to those with a key… which of course could not be seen from Google Earth 😉 Luckily, after a few minutes, a marathon runner using this for his training session appeared and let us onto the track. Initially I set up for shots using the 70-200mm at the long end to make it look more like a traditional sports shot with a wide aperture using continuous AF (which I always have enabled, using the AF-ON button on the D200). However, as often happens, towards the end of the session I wanted to do something different, and made a few shots with the 17-55 at the widest end, just to have something completely different also. Due to the fast pace and the proximity of the models, I pre-focused and put the camera on a middle aperture, to make sure most of the important stuff would be in focus. Back home I went through the shots, and figured that the wide perspective actually gave a more dramatic appearance, and this is now the shot that I prefer. However, the jury is still out, and let’s see what the will editor pick. You can see a few more from the series here. The lesson learned: I had 100+ traditional shots and 5 or so of the wideangle stuff. There is probably a 2-3% keeper rate of the traditional shots, and around 50-60% keeper rate amongst the last ones. And I often find it so: Either the very first shot is the best or then the very last ones are. So either you know exactly what you want, and go for that — before the model(s) wear out — or then you keep on experimenting until you feel you have “the right shot”. And in this case “wearing out the model” is quite literally what happened: Quite a few passes (at full speed, of course) had to be done before I got this shot. Thanks to Claus and Christoffer, and to Rie for the the challenge. You are currently browsing the Per's Page weblog archives for September, 2007.